Deeply effective against stubborn smells, Bobbi Panter® Stinky Dog Shampoo combines a vegetable protein deodorizer with delightful lavender, rosemary, and chamomile extracts. Leaves dogs with a crisp, clean fragrance. 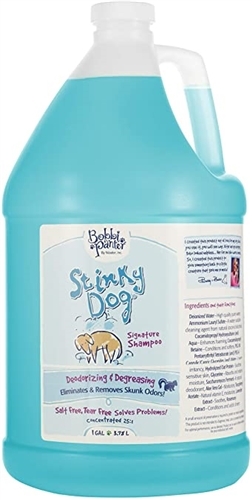 REMOVES SKUNK IN ONE WASH!